Joy at the weekend to join over 2,000 in the Abbey to welcome Alan Smith, new Bishop of St Albans, my new episcopal next door neighbour. 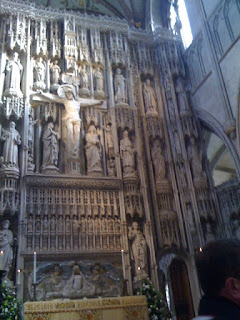 The sun shined as we all packed into St Albans Cathedral, site of the earliest Christian martyrdom in England. 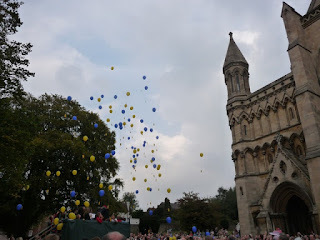 One local paper caught Saturday’s celebration nicely. Thousands of joyful people celebrating together is of zero interest to most English media, who have their own agendas to pursue, but it is an amazing enterprise and tremendously moving to be part of such a thing. Jeffrey John and colleagues did the whole do proud — no mean achievement. It was an icon of the civil society that we take for granted, in the same way as we tend to assume all the wiring in our homes is there and works, without anyone having to pay any attention to it. In a way that's the whole idea, but it’s fascinating to see it all laid out in one place. It was an inspiring service, with contributions from all sections of the church. Glad the sermon is on the web now. It was very difficult to hear from where we Readers were sitting. He's a good 'un and no mistake. look after him. 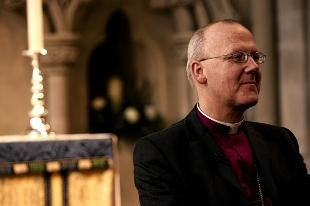 I've had a day of two Bishops John and now a blog of two Bishops Alan. Did I wake up on some strange ecclesiastical version of Whicker Island?? Glad to hear of a good time at the cathedral though!